BBM listed a new Lions set on their website today. It's a 28 card box set that features 9 of the Lions "popular young players". 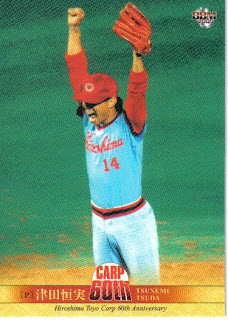 Looks like there's three separate styles of cards in the set - an "expression" subset, a home uniform subset and an away uniform subset. Each player has a card in each of the subsets - that adds up to 27 cards. The 28th card is an insert card. 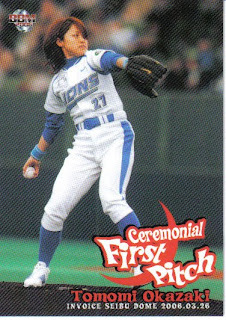 I suspect that if Yusei Kikuchi had signed with another team other than the Lions, there'd be a box set for that team instead. Anyway, the set will be released in late March. I received the cards from my first order placed through KuboTEN today. The whole process was pretty easy, although a bit slow. I had won the auction in question back in December, but I waited until mid-January to actually get the cards shipped as I was waiting to see if there was anything else I wanted to get. So it looks like it took about 5 weeks to get the cards, which seems a little long to me, although the weather may have disrupted things somewhat. I'd be interested in knowing what others have experienced. So that leaves me with 10 regular cards and 4 "The Scene" insert cards to go to complete the set! 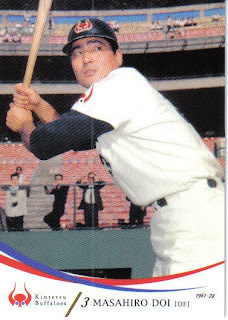 For no reason other than I love old Yamakatsu cards, a 1977 Yamakatsu card of Masayuki Kakefu. Since 2004, BBM has included a subset featuring people throwing out the first pitch at ballgames in the 2nd Version set. 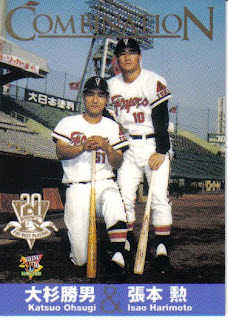 A couple of times, the person in question is a former player (Tetsuharu Kawakami, Akira Ohgi, Jim Paciorek) but usually they are a celebrity in some other walk of life than baseball - sumo wrestler, model, actor, politican, etc. The latest Prestige Collectibles Auction has started and will be running until March 4. BBM is releasing a memorial set for Norihiro Akahoshi in March. It will be a 28 card box set featuring 27 "regular" cards and one insert/autograph/memorabilia card. OK, maybe I'm being too optimistic here, but I'm guessing that Topps has finally finished making World Baseball Classic sets for the 2009 games. So here's a wrap up on what all they produced last year. 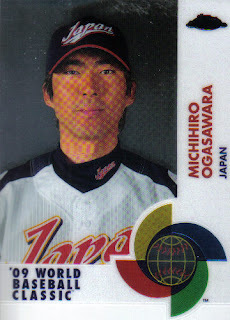 This (obviously) does not include the cards Konami produced in Japan for the WBC. I suspect that they produced a complete team set for the Japanese team, but the cards are going for much more than I want to pay for them on eBay. BBM's first official set for 2010 was in stores last November. It's the latest "Historic Collection" set called "Memory Makers". Like most of the previous editions, this year's set has 144 cards - 72 OB players and 72 active players. The active players are evenly divided among the 12 teams (6 per team) but the OB players are not. So not knowing what the set really commemorates, it's hard to say whether the player selection for the OB players leaves anyone obvious out. What I can say about the selection is that (like the Epoch All Japan Baseball Foundation set) it's an eclectic group of players. 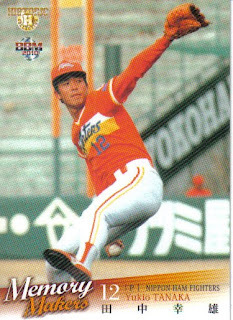 I'd guess that only about a third of the OB players in the set have appeared in any of the last three years of "Historic Collection" sets (and some of them like Masumi Kuwata, Kei Igawa, Masahide Kobayashi and Kazuhiro Kiyohara did so as active players). The set is lacking any of the really big names - no Oh, Nagashima, Nomura, Kaneda, Ochiai, Kadota, Yamamoto, Kinugasa, etc. 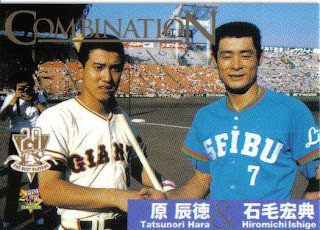 While as usual the bulk of the players are from the 70's and later, there's a couple guys like Eiji Bandoh, Isao Hirono and Hiroshi Takahashi who played earlier. It's probably safe to say that this set highlights OB players who are bit more obscure than normal. 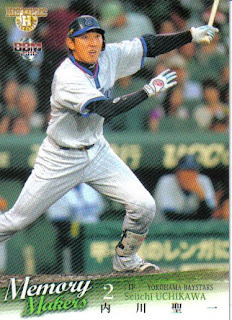 On the other hand, the active players in the set are pretty much a straight forward representation of the current stars of NPB - Ramirez, Darvish, Aoki, Iwakuma, Ogasawara, Nakajima, etc. From top to bottom, the OB cards for Eiji Bandoh (#056), Hisashi Ohno (#041) and "the other" Yukio Tanaka (#022) and the active cards for Seiichi Uchikawa (#142) and Nobuhiko Matsunaka (#107). This Google translation of the checklist gives a wealth of information in English, but it doesn't give a release date for the cards. UPDATE: Yakyu Baka reports here that they will go on sale March 8. 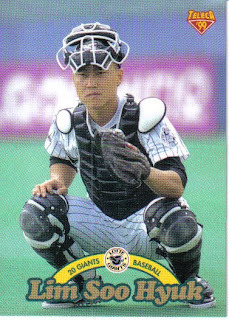 Former Lotte Giants catcher Lim Soo Hyuk (or Lim Su-Hyeok) has passed away after spending 10 years in a coma. 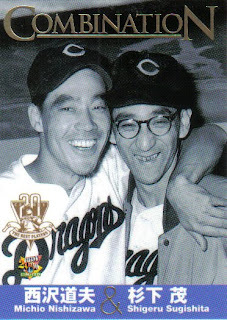 Both East Windup Chronicle and True Stories Of Korean Baseball have posts about it. 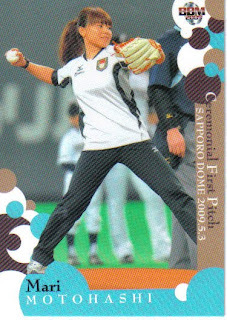 The card shown is 1999 Teleca #44. 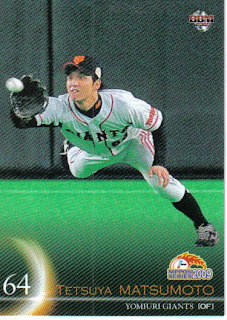 BBM completes its 2009 line of cards with the publication of its annual Nippon Series set. 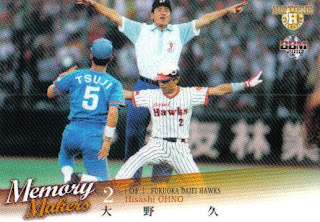 This year's edition is a 65 card set featuring all the players who appeared in the Series between the Hokkaido Nippon Ham Fighters (31 cards including the manager) and the Yomiuri Giants (28 cards with their manager). 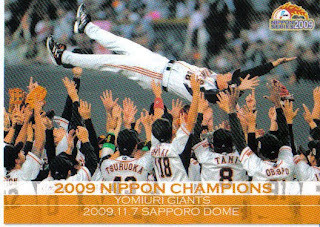 There are also the usual cards for the Series MVP (Shinnosuke Abe), the winner of the "Fighting Spirit" award (Shinji Takahashi) and the three winners of the "Outstanding Player" awards (Dicky Gonzalez, Yoshiyuki Kamei and Eiichi Koyano) as well as a card celebrating the championship of the Giants (shown above, card #S65). The cards themselves are beautiful - full bleed photos without a lot of clutter. I have my same complaint as last year - that there's not a lot that makes these photos stand out as happening in the Series, although Marc Kroon's card (#S09) showing him on his knees pointing to the sky after recording the final out (I assume) kind of stands out. BBM does try to get pictures from the actual Series for everyone who appears in the games. 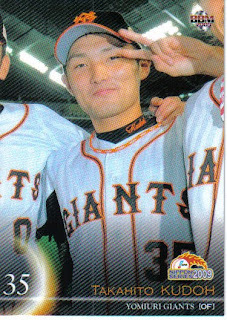 I was amused that this year they could only show Takahito Kudoh (#S27) being introduced in a before-game ceremony - he only played in one game and didn't get an at bat - I assume it was probably a defensive substitution late in a game, but I haven't had a chance to look it up. 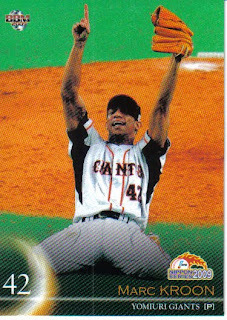 A couple of other notes about the set - I believe the set contains the first BBM card of Giants pitcher Wirfin Obispo. 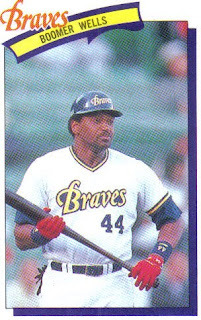 Also, Termel Sledge's first name is mispelled as "Terrmel". 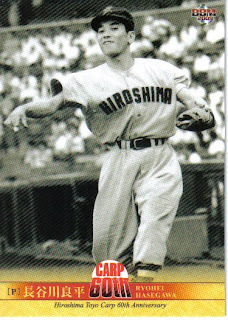 I mentioned the other day when talking about the Carp 60th Anniversary set that after the 1949 season, NPB expanded from eight teams to fifteen. 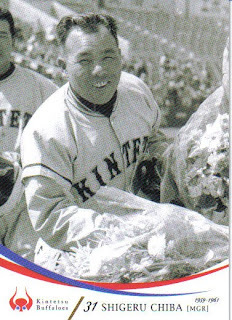 Another of the teams that were added (in addition to the Carp) was a team that was then called the Kintetsu Pearls. This team would change it's name to the Kintetsu Buffalo (yes, singular) in 1959, the Kintetsu Buffaloes in 1962 and finally the Osaka Kintetsu Buffaloes in 1997. 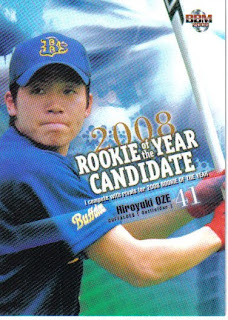 Following the 2004 season, Kintetsu sold out and the team "merged" with the Orix Blue Wave - the new team being called the Orix Buffaloes - but essentially the franchise that had been the Kintetsu Buffaloes folded and ceased to be. 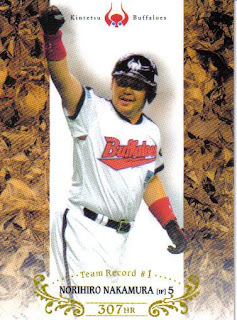 BBM has issued a set this past fall to celebrate the Kintetsu team. They don't really refer to it as a 60th Anniversary set, but rather a Kintetsu Memorial set, although they produced a boxed set in late 2004 as a Kintetsu Memorial set. 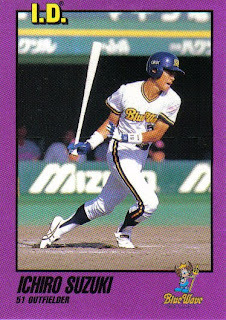 The set follows the now very familiar pattern of the nine previous Anniversary sets done by BBM - there's a six card "History Of Kintetsu Buffaloes" subset, 84 cards for former Kintetsu players (no subset for the 2009 team since there wasn't one) and a nine card "Team Record" subset showing the career team leaders in various categories. 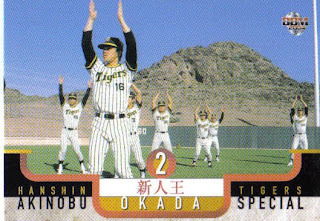 As always, the former players subset contains both OB players and active players who are playing elsewhere (Norihiro Nakamura, Tuffy Rhodes and Hisashi Iwakuma for example). The OB players are a little heavy on the 70's and later (again as usual) - there are only two players shown wearing Pearl uniforms in the group - Akitoshi Kodama and Fumio Takechi. Most of the Buffaloes managers are represented either as manager (Akira Ohgi, Osamu Mihara) or players (Keishi Suzuki, Masataka Nashida). 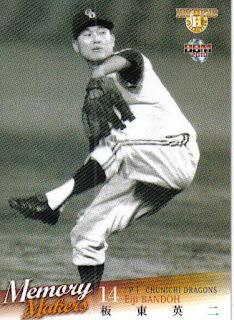 I was really happy to see a card of Shigeru Chiba - I believe that the team was renamed the Buffalo in his honor when the "Formidable Buffalo" became the manager in 1959. The main player that I see absent is Hideo Nomo. There are a number of gaijin included (Ben Oglivie, Jack Bloomfield, Phil Clark, Ralph Bryant), but there were a couple of others (Charlie Manuel and Carl Boles) who could have been included as well. 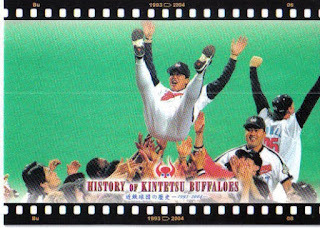 From top to bottom, the "History Of Kintetsu Buffaloes" for the years 1993-2004 (showing the celebration for the Pacific League pennant in 2001) (#06); the player cards for Shigeru Chiba (#11), Masahiro Doi (#15), Tuffy Rhodes (#82) and Hisashi Iwakuma (#88); and the "Team Record" card for Norihiro Nakamura. The card shown is 2008 BBM 1st Version #253. Thanks to Yakyu Baka for the links. The 1949 NPB season featured eight teams in a single league. 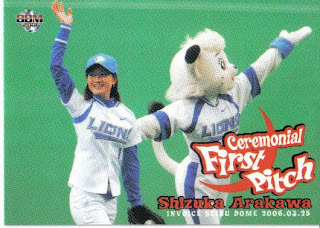 Following that season, NPB expanded to 15 teams spread across two leagues - the Central and Pacific. 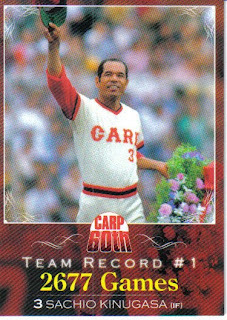 One of the new teams was the Hiroshima Carp (later the Hiroshima Toyo Carp). BBM celebrated the founding of the team by issuing a 60th Anniversary set late last year. This pack based set follows the pattern established by the other eight previous team Anniversary sets BBM has produced in the last couple years. 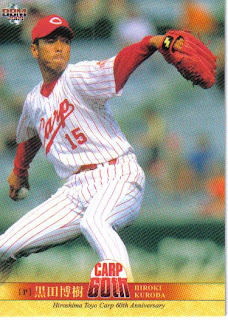 There's a six card "Carp History" subset that summarizes each decade in the team's history. 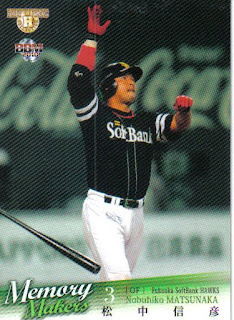 There are 66 cards for former players, both OB players and players who are still active with other teams either in NPB (like Tomoaki Kanemoto) or MLB (like Hiroki Kuroda). 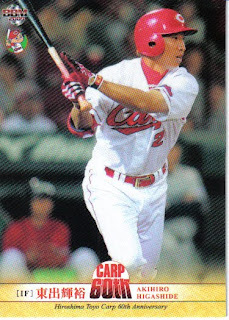 There are 18 cards for the 2009 Carp team (including the since fired manager Marty Brown) and a nine card "Team Record" subset featuring the holders of various career Carp team records. 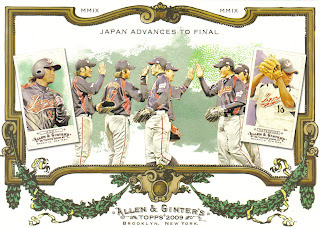 As you might expect, there's a lot of common territory between this set and 2008's Hiroshima Memorial Set which commemorated the closing of Hiroshima Municipal Stadium. 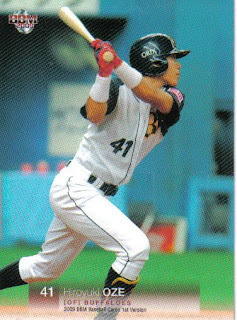 Only one of the OB players in the previous set (Yutaka Enatsu) does not appear in the new set. 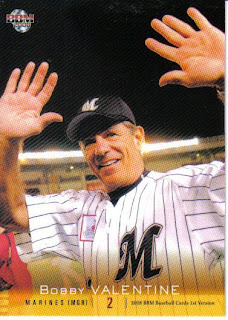 He's probably the most glaring absence in the group of former players in the set. While the bulk of the players are from the 70's onward (and include pretty much who you would expect - Koji Yamamoto, Sachio Kinugasa, Manabu Kittabeppu, Yutaka Ohno, etc), there's a decent representation of some of the older players - Ryohei Hasegawa and Katsumi Shiraishi for example. My biggest complaint (actually my usual complaint about these sets) is that there aren't many color pictures for the older players. 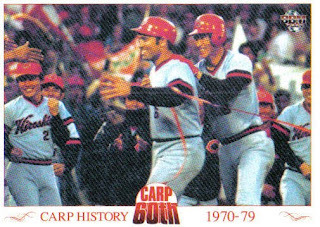 From top to bottom, the "Carp History" card for the 1970's (#03), former player cards for Ryohei Hasegawa (#07), Tsunemi Tsuda (#51) and Hiroki Kuroda (#71), 2009 Carp card for Akihiro Higashide (#83) and the Team Record card for Sachio Kinugasa (#91). 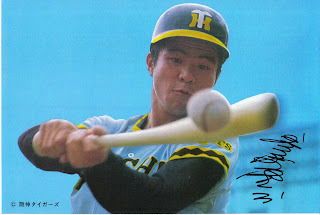 - There's a guy claiming to be selling a card of "Sadaharu Oh All Time Home Run King" except that he isn't - he's selling a 1981 Calbee card of Masayuki Kakefu of the Hanshin Tigers. So he doesn't even have the right team. I sent the seller a message two weeks ago and he hasn't changed the listing, so I don't feel TOO bad mocking him here. 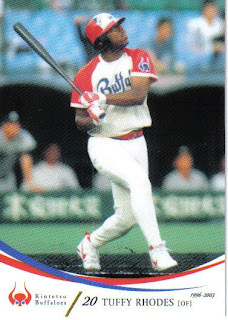 I realize that he's probably unfamiliar with Japanese baseball and that Oh is probably the only Japanese player prior to Hideo Nomo that he'd ever heard of, but if I were to put a 1977 card of Dave Parker up on eBay and claim it was Henry Aaron, people would think I was an idiot. Sure, there's a superficial similarity between Parker and Aaron, but they don't look that much alike. Same with Oh and Kakefu. 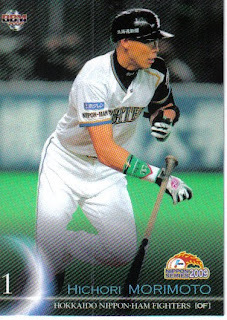 Jason has done the research on finding Japanese Baseball Card stores online and it's all here. Jason's also done a box break for the 2000 Epoch stickers and has started one for the 2000 Power League collectible card game. On their website this week, BBM announced the first of the 2010 team sets - the Swallows and the Eagles. The Swallows set will have 99 "regular" cards - 75 cards for the players, coaches and manager, 4 cards for a "Uniform Number 1" subset, a checklist card, one card that I have no idea what it is, a nine card puzzle subset, a three card "Closeup" subset and six cards for the BBM 20th Anniversary cross-set subset. There's a 7 card "League Leader" insert set and the usual memorabilia and autograph insert cards. There will also be parallel sets for the player, coaches and manager cards and the "League Leader" inserts. 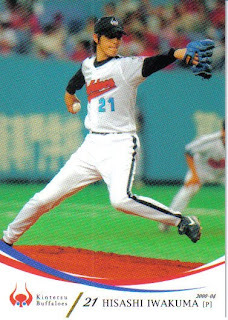 I think the "Uniform Number 1" subset has something to do with Norichika Aoka changing his uniform number from 23 to 1. 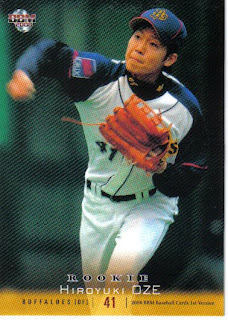 The subset probably shows other players who've worn number 1 for the Swallows, like Takahiro Ikeyama, Tsutomu Wakamatsu and Akinori Iwamura. The Eagles will also have 99 "regular" cards - 72 cards of the players and manager, 1 checklist card, 4 cards of "promising young players", 4 cards for players who reached career highs in 2009, a nine card puzzle subset, a three card "New Force" subset and six cards for the BBM 20th Anniversary cross-set subset. There's a nine card "Leading Players" insert set and some autographed insert cards. Both sets will be released at the end of March. I don't know what to say here, other than my thoughts go out to his family.